Homesteader Profile: Christine is a married mother of two. She is a work-at-home mom and author of Once Upon a Time in a Bed of Wildflowers. Christine lives on 1/10th of an acre in Upstate New York. When I say that I’m a homesteader, I means something a little different than a lot of people would expect. My husband, two children, golden retriever, and new kitten (Isis – named after the goddess of marriage and homemaking), and I live in the city, so we don’t have very much space. We don’t have animals (yet) and we don’t grow much food. What we do is take care of the Earth the best way we can. We find the rhythm of the seasons and try to dance with it. I buy local, sustainable foods. I can and preserve in-season. I avoid processed food and GMOs. My husband hunts. I make our all-natural cleaning products and personal care products as much as possible. I hangs their clothes out to dry in the sun and I make sure our yard is full of bee and butterfly-friendly plants. My property has about eighty square feet of vegetables, herbs, and raspberries and another sixty of strawberries, blueberries, and flowers. I also have sixty-four feet of brand-new raised beds and a thirty-five square foot butterfly garden shared with the neighbors. I hope to plant more bee and butterfly-friendly flowers this year. My garden mostly grows food for snacking on. We go out and get sun-warmed cherry tomatoes for lunch and eat raspberries and beans right out of the garden. My family and I rely on farmers’ markets for most of our food. My 1910s home still has its original pantry and what is interesting is that when we first went to put food into it, it was too small. There wasn’t room in it for boxes of cereal and other processed foods. As we have moved away from these processed foods – canning and cooking from scratch – the pantry is laid out perfectly! I take this as a sign that we’re doing a lot of things right! Christine shares her recipe for Blueberry Currant Jam here. I have access to my parents’ farm. My parents don’t farm it and never actually were farmers. The land is leased, but we can still pick all the apples we want, go for walks, and hunt on the land. Visiting the farm helps us keep up with our homesteading spirit. Get along with your neighbors! There just isn’t enough space to *not* like each other – and hopefully your neighbors will feel the same. Especially since homesteading might lead to strange things (like chickens in the backyard – we don’t actually *have* chickens, but our one neighbor was skeptical, yet supportive, of the idea; the other asked us if we would get ducks instead). It is perfectly acceptable to bribe them with homemade cookies or jam, fresh vegetables, and wine. This is my style of homesteading. I can relate to many parts of your story! I especially like the detail about your pantry not being suited for a bunch of boxes and products. 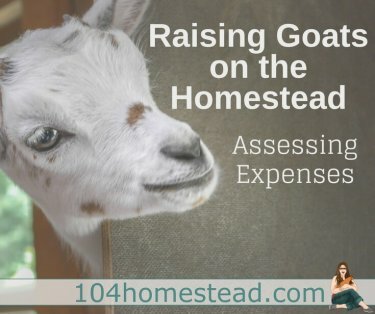 🙂 Great writeup Jess, and great job homesteading, Christine! Christine is a wonderful example proving someone doesn’t need 50 acres and a mule to do it right. You had me giddy to write this as soon as you said you grow food for snacks. I think so many people can relate. Especially the part about preserving food from outside sources. I’m sure a lot of people never considered that concept.